Their chair raiser made a big difference! It does exactly what I need it to. I can get out of my chair safely now, where before my chair used to tip up. You have had the Bed Chair (EAB) for about a month now have you found it useful Joy? Oh, very useful, it’s so easy to get up and down when I need to get to the toilet. It’s a piece of cake. Do you find it comfortable? Very comfortable. How about the rail (Bedside Transfer Rail)? It’s very useful to sit up, grab the rail and pull myself up. Would you recommend the Bed Chair to anyone else? Definitely, for anyone who has difficulties getting in and out of bed, it’s ideal. I have had my leg lifter nine months now and am very happy with it. Having the Leg Lifter to help me into bed was the main thing that enabled me to get out of hospital and back into my own home. So good being able to back into a bed with such ease, good placement of buttocks & no strain on arms & shoulders. Slept for 6 hours the other night and was thrilled. Thank you. 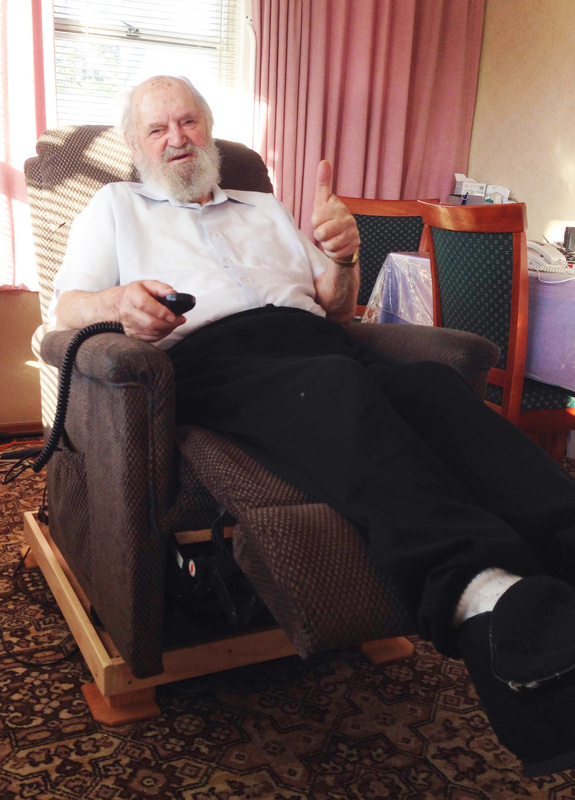 We have received the chair raiser and are very pleased with it. I would like to thank Jennifer for all her help. This shower insert is fantastic! Its made our lives easier. Thank you so much. I would recommend this to anyone who needs it. I have painful arthritis in my knees which makes it hard for me to get out of my chair. The chair raiser makes it easier now because my chair is at a better height. We had a man that fell in the lift recently, and the Elk lifting cushion worked excellently.